Strengthen your back, biceps, and other upper body muscles in the comfort of your living room or dorm with the Iron Gym workout bar. Designed to fit conveniently in most doorway frames or sit on the floor for pushups, dips, and sit-ups, the Iron Gym is an ideal choice for people who want to get fit without buying expensive, space-intensive weight sets. When installed in the doorway, the device lets you perform pull-ups and chin-ups, with three grip positions--narrow, neutral, and wide--for working the inner and outer back. Once you're done with your back workout, you can quickly move the Iron Gym to the floor, where you can perform pushups while facing down, tricep dips while facing the other way, or sit-ups using the Iron Gym for foot stability. The Iron Gym--whose durable steel frame installs quickly without tools or fasteners--holds up to 300 pounds and is designed to fit residential doorways 24 to 32 inches wide, with doorway trim or molding up to 3.5 inches wide. 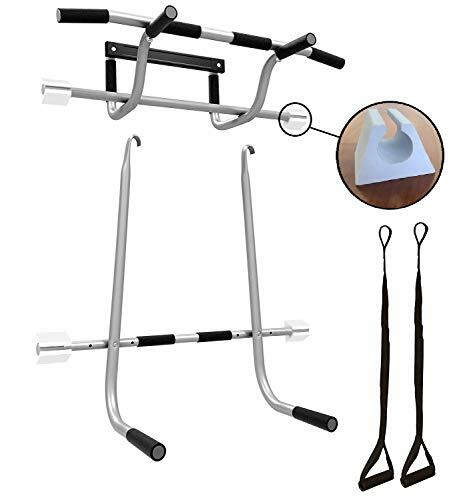 The ProsourceFit Multi-Grip Pull-Up/Chin-Up Bar provides an inexpensive way to tone and build muscles at home, without large equipment or marring your doorframe with installation screws. Designed to slip into any standard doorways, the heavy duty Multi-Grip Pull-Up Bar can be installed anywhere you have a sturdy doorframe from 24 to 36 . And if you have a permanent location in mind, it can also be mounted to the doorframe with the optional, included J brackets. 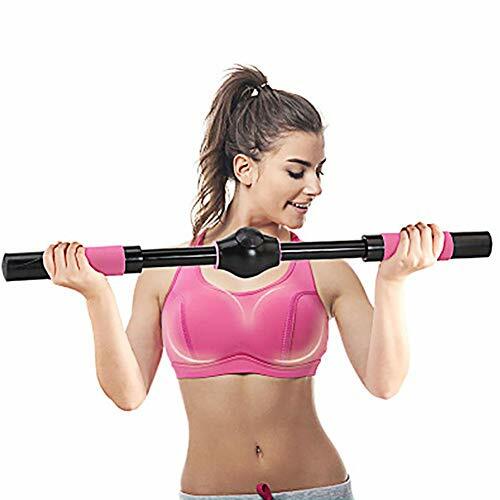 12 cushioned grip positions enable you to be able to develop your back, chest, shoulders, arms, and abdominal muscles with one simple piece of equipment. The bar now also includes 2 optional slip-on foam grips for the outermost handles to protect your doorframe. In addition to traditional pull-ups and chin-ups, the bar allows you to perform closed-wide angle and hammer grips as well as multiple leg raises and oblique curls. Built to last, the Multi-Grip Pull-Up Bar is constructed of high-grade steel for durability, safety, and long-term use. The bar can hold up to 300 pounds within a sturdy doorframe, making it ideal for a variety of users. This is one of the best pull-up bars on the market, yet we sell it at an incredibly affordable price to make home workouts convenient and accessible to anyone. Train like a pro, train with ProsourceFit! Maximize your workout with the Sunny Health & Fitness Doorway Chin-Up Bar. Sturdy, chrome plated steel bar, with a max weight capacity of 220 LBS, and non-slip, soft padded hand grips ensure maximum stability and grip. The simplicity of the Sunny Health & Fitness Doorway Chin Up Bar is its strongest asset as it allows you to have full control of your workout. Adjustable length (24. 5 to 36 inches) provides a customizable workout area and fits into any standard door frame. 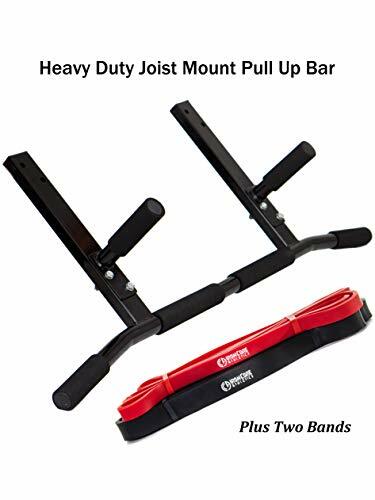 It is the ultimate multi-tool workout bar as it is ideal for pull-ups, chin-ups, leg lifts, or you can use it as a foot anchor for sit-ups and crunches. 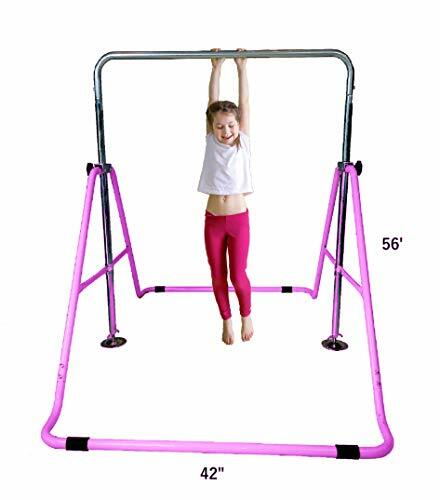 Includes weight bearing brackets for maximum stability during your chin-ups and non-weight bearing brackets for sit-ups; the brackets ensure you are adequately supported during your exercise. 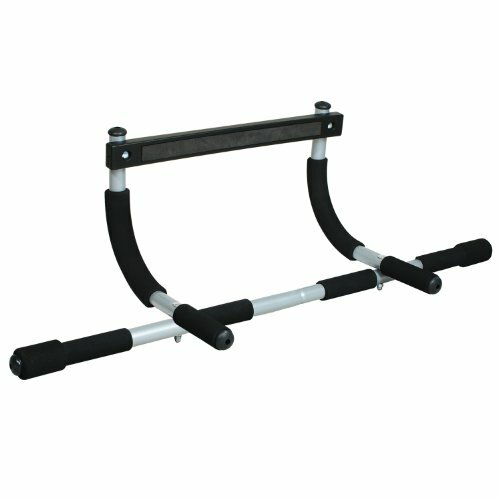 STURDY CHROME PLATED STEEL BAR: Train like a pro with the tough and secure exercise trainer supporting tough workouts. When mounted properly, the fitness bar holds up to 220 pounds giving you full support for pull-up and chin ups. Max weight: 220 lbs. 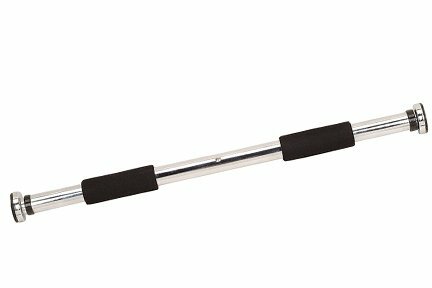 ADJUSTABLE LENGTH: Easily adjust this exercise bar so you can take your fitness on the go! Adjustable length (24.5 to 36 inches) provides a customizable workout. COMFORT GRIPS: Minimize risks of calluses or hand cramping with padded handles. Non-slip extra-long foam grips for extra comfort to minimize hand fatigue. Put the door bar lower to the ground and use it to help you perform push-ups! EASY STORAGE: Set up in seconds in almost any doorframe and easily store away in a closet. Adjustable length (24.5 to 36 inches) provides a customizable workout for your home and body. Perform pull-ups, push-ups, sit-ups, hanging crunches, tricep dips and more with the Pure Fitness Multi-Purpose Workout Bar. Installing in seconds without damaging the doorway, the sturdy workout bar provides you with a vehicle for a powerful strengthening and toning workout for your entire body. Six foam padded grips with eight grip positions give you the option to perform exercises more effectively. Buffs and beginners can create the ideal workout with the included instructional workout guide. 2.If the door is in a corner, the distance beween the doorframe(exclude the thickness of door) and the wall should be larger than 33.46"
3.The depth of doorframe should be no larger than 8.27"
In additon to being the owner of Iron Age pull up bar, I'm also a lifelong pull-upper, who was extremely disappointed of the easy-bending and door-damaging bars in the market. So I decided to design a pullup bar both worthy of both my workout and my woodwork with . After three years' hard working with my our team, we have the ultimate Iron Age leverage-based multi-grip portable doorway chin up bar. 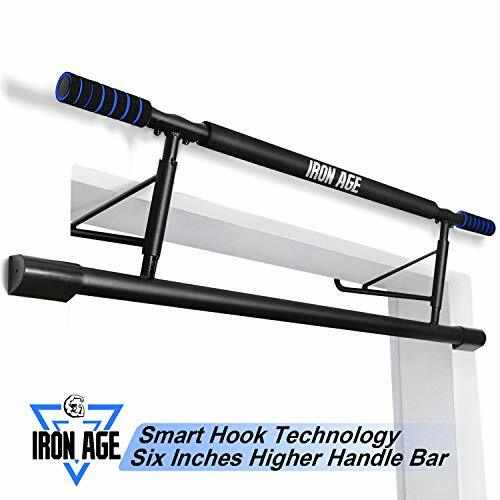 Unlike most other doorway bars,Iron Age hanging bar allows you to perform true wide grip pull ups. The grips extend to the outsides of your doorframe, not inside it. So it is easy to activate different muscles via gripping at different distances such as close grip, neutral grip, wide grip, etc.The various grips allow you to target different muscle groups in your shoulders, arms, back, etc. XL Doorway Pull Up Bar with Elevated Bar & Adjustable Width Get better workouts every day with the elevated XL Doorway Pull Up Bar by Ultimate Body Press. With wide diameter heavy steel tubing, premium hardware, exclusive ABS bar couplers and long lasting high density foam padding, The XL Doorway Pull Up Bar combines stable workouts with incredible range of motion. Three grip positions target individual muscle groups across the chest, arms, back and core with a super quick change over to floor exercises as a push up and dip stand and as a brace for sit ups. The elevated bar is great for taller users and gives you full range of motion for pull ups and expanded exercises with optional accessories like suspension trainers and ab straps (accessories sold separately). 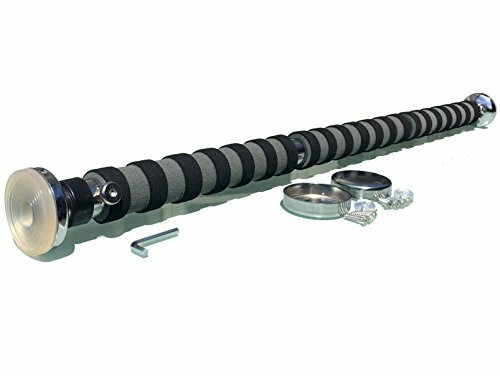 Expandable bar ends make the XL Doorway Pull Up Bar a universal fit for residential doorways 24 36 in width without screws or drilling. Assembly is straight forward with all hardware and tools provided and you can shop with confidence, the XL Doorway Pull Up Bar is backed with our 100% satisfaction guarantee. Prime eligible shipping and Ultimate Body Press 100% Satisfaction Guarantee. You will love owning the this bar and the workouts, or we will refund your money. Quality Construction Supports the Results you Want Doorway pull up bars have rightfully earned the respect of fitness enthusiasts. Great workouts at home start with pull ups and the convenience of having you bar ready to go at a moment's notice makes it easy to build on your results daily. The addition of the elevated bar extends your range of motion and brings home the kind of performance you expect from the mounted bars at the gym. To handle the added leverage of the elevated bar, the Ultimate Body Press XL Pull Up Bar uses the thickest steel, quality hardware and our exclusive ABS couplers so each crossbar can be properly tightened and locked at 90 to the uprights. You feel the difference on the wall with every rep and most importantly, the XL Doorway Bar retains it's shape under strenuous floor exercises. The elevated doorway bar that supports your confidence leaves you free to focus on form and repetition for the results you want in less time. Shop with Confidence At Ultimate Body Press our passion is providing high quality affordable fitness equipment for real workouts that fit your spaces and how you like to exercise. We are proud to serve your gym needs and want to meet and exceed your expectations for customer service. If you need any assistance with your purchase, customer service has complete resources to assist you and is available by phone or email during regular business hours Monday-Friday. Order Your XL Doorway Pull Up Bar The XL Doorway Pull Up Bar gives you better workouts every day for the results you want in less time. Your satisfaction is 100% guaranteed, order yours today. ABS couplers secure a tight and rigid frame. High density foam grips reduce strain for better workouts. Quickly switch between doorway and floor exercises. 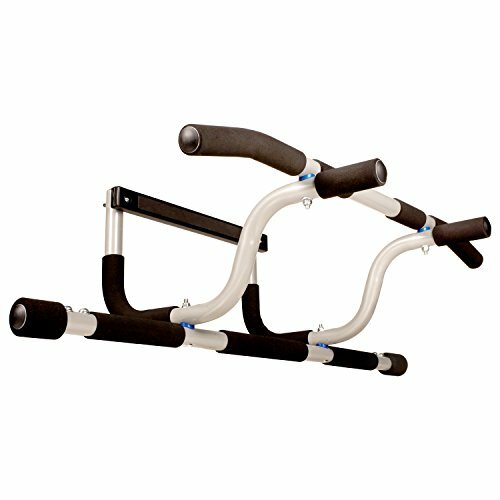 The Maximiza PLUS Pull-up Bar is a perfect addition to any fitness routine for upper-body strength and toning. Its versatile uses include pull-ups, chin-ups, hanging leg raises, sit-ups and crunches. As you gain strength, it is easy to add more variations and difficulty into your Pull-up Bar exercises. With the Maximiza, you need minimal space in your house to do highly effective bodyweight exercises. The heavy-duty chrome steel bar and the multiple screw-in door mounts provide safety and stability while giving you the flexibility to move it to different places or heights. The non-slip extra-long foam grips provide a firm grip and extra comfort to minimize hand fatigue. The Maximiza Doorway Pull Up Bar is adjustable to fit wide doorways between 35 and 50 inches when extended. It comes with 3 sets of heavy-duty door mounts which can be screwed into up to 3 wooden doorframes in your house. Mounting Note: Always secure to the doorframe with the provided screw-in door mounts. The maximum installation height and bodyweight supported will vary depending on the individual circumstances including required usage, mounting method and the doorframe. We always recommend using the Heavy-duty door mounts for pullups and chin-ups. Maximum weight for typical installations is 330 lbs / 150kg. Safety Note: Each time the bar is used, you should cautiously apply your weight to it during the first few exercises to confirm that it is secure and will safely hold your weight. 100% Satisfaction Guarantee: If you aren't completed satisfied, please contact us for a full refund - no questions asked. Triple Door Gym Ultimate 3 in 1 Doorway Trainer Raised Height Pull Up Bar, Dips Bar & 2 Suspension Straps for A Total Body Home Workout, Screwless Installation On All Doors 24"-36"
Here's How You Can Enjoy A Lifetime Of Professional Training For The Cost Of Just 1 Month At The Gym! Sick and tired of driving every day to the gym and wasting your money on costly subscriptions? Looking for a total body workout gym that will allow you to train your entire body at the comfort of your home? Presenting The Triple Door Gym Ultimate Pull Up Bar! Now you can perform over 35 different exercises with just a single doorway Pull Up Bar! 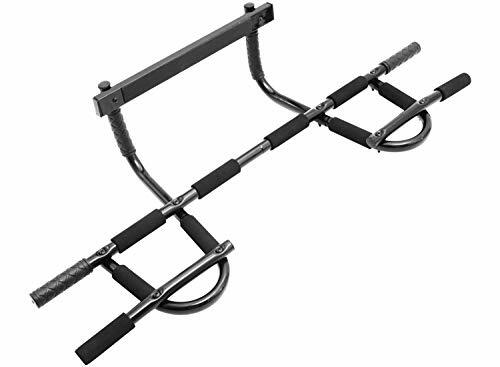 The package includes the Triple Door Gym pull up bar, unique steel extension bars for dips and heavy-duty suspension straps for suspended push ups and more! Transform your entire body with 1 doorway pull up bar and get a complete workout at home! You Can Install It In Seconds! You don't have to damage your door frame anymore in order to install your triple workout pull bar, since it utilizes leverage to hook on the solid uprights of the doorway without any screws, bolts or holes! Fits On Any Standard Door Without Any Hassle! Perfect for all doors from 26" up to 36", the Triple Door Gym can hold up to 300lbs of weight! Make The Most Of Your Free Time! Now you can exercise on your own schedule with our ergonomic and sturdy steel doorway pull up bar, even in the middle of the night! The Perfect Gift For All Fitness Enthusiasts! Spoil your fitness junkie friends or family members with the Triple Door Gym doorway pull up bar and help them take their training to the next level! Click "Add To Cart" Now While Supplies Last! UNLIKE OTHER FLIMSY & IMPRACTICAL DOORWAY PULL UP BARS that may damage your door and train only one muscle group, the Triple Door Gym is the ONLY pull and dips doorway gym bar that hooks on your door without any screws, holes, bolts or damage! WORK EVERY MUSCLE GROUP IN YOUR ENTIRE BODY from the comfort of your home with our premium pull up bar, that combines pull ups, dips and suspension exercises! Plus, its simple design makes it ideal for both beginner and advanced athletes! HEAVY DUTY STEEL DESIGN WILL ENSURE YOUR SAFETY, so you can focus on your fitness training without any worries! The ergonomic design and comfortable, non- slip foam grips will allow you to perform all exercises effortlessly! The robust steel frame can hold up to 300lbs of weight! 35 DIFFERENT BODY WEIGHT EXERCISES will allow you to transform your body without having to waste your money on costly gym subscriptions! The Triple Door Gym doorway pullup bar is perfect for dips, pull ups, bodyweight rows, leg raises, suspended push-ups and many more exercises! 100% SATISFACTION OR YOUR MONEY BACK! Try our innovative door frame pull up bar absolutely risk-free for 30 days and if you're not 100% thrilled with its performance, we promise to offer you a prompt and full refund! What are you waiting for? great for Children between 3 to 9 Years old. Children will enjoy endless fun & active playtime with this Large Sturdy Jungle Monkey Bar Climbing Tower. made of kids safe long lasting strong Steel. can withstand kids Swing, Climbing rope and ladder add one. Pull up bars are the ultimate tool in upper-body training Research shows that the pull up bar is more effective for biceps than dumbbells! Did you know? Screws and pins can damage your walls and ceiling Other bars damage doorframes and diminish the appearance of the room Most bars don t fit every doorframe, nor are they as secure With other pull up bars, your feet touch the floor during exercise Only Ikon fitness has solved these problems! No screws, perfect grip - even wider doors. Benefits Almost 8 higher than competing products thanks to raised bar design Train on the floor for pushups, sit ups, dips, and more: complete upper-body training Deeper pushups and increased range of motion for better results Maximum stability: solid, high quality construction Thick rod for firm grip High quality foam: no blisters on your hands Made for wider doorframes: fits a door width of 27.56 - 36.22 (70 - 92 cm) - Measure the space inside your door frame. 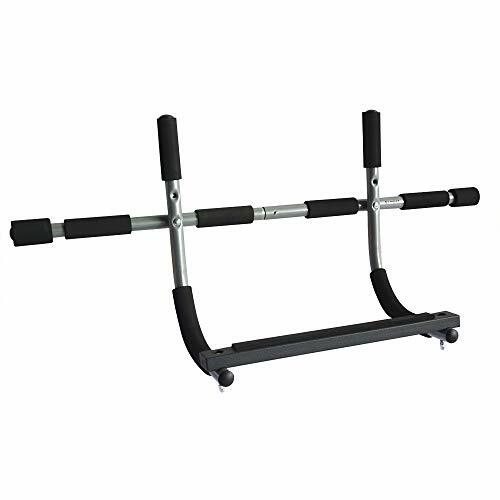 The Pull Up Bar is designed for spaces between 27.56-36.22 inches (70-92 cm) Just fold and store to save space Safe weight limit of 440 lb (200 kg) Specially designed rubber pads protect doorframe from damage Other special features High quality metal construction for long lasting life Frame depth of 4.73 - 8.27 (12 - 21 cm) Discounted price for a limited time. Get a full upper-body workout at home and take your fitness to a new level with ! Now add to cart. Comfortable and ergonomic design to help protect wrists. Enhanced and widened grip, ideal for deltoid growth; Comfortable - no more blisters on your hands! Soft foam grip - durable and nonslip. Extra thick rod ensures firm grip. No screws - ready to use - no need to assemble! Simply hook right into the doorframe, get a full body workout, and fold away for storage! Raised bar - Suitable for tall people. Designed for wide doorframes with a maximum width of 36.22 (92 cm) and depth of 8.27 (21 cm) - Made for wider doorframes: fits a door width of 27.56 - 36.22 (70 - 92 cm). Maximum stability, robust, high quality construction. Heavy duty design prevents movement of the bar during exercise. Safe weight limit of up to 440 lb (200 kg). Cushioned pads prevent damage to doorframe. 100% satisfaction ! If you do not like the pull up bar max for any reason, just send it back within 60 days. Our friendly customer service members will refund you for the full amount! 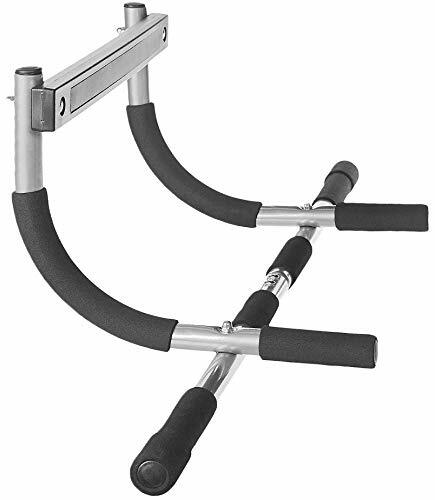 Add the pull up bar max to your shopping cart now. Please warm up fully before training to avoid physical injury. High-quality ABS plastic, thick environmentally friendly foam grip, non-slip hand care design is comfortable, six gears adjustable, to meet the needs of different stages of exercise. This is a fitness rally designed for female users. It is effective for slimming arms, slim fit and enhancing breast for a perfect body curve. Ideal for arm, shoulder and chest exercises, easy to use. Easy to carry, you can exercise as you like in the office, school, home, travel and other places. Retractable tension bar, free stretchable, stretchable length 88cm/34.65in. 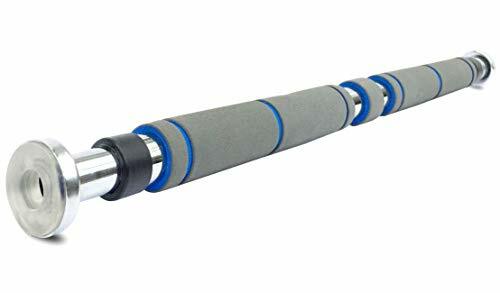 FreeTrade Pull Up Bar Doorway Heavy Duty Chin Up Bar Trainer For Home Gym pull up bar or for situps, pushups and dips. device that promises to sculpt your upper body through pull ups, chin ups, and abdominal work. - Wide Pullups - Standing upright, pull navel in and grab wide section of bar. Palms face out. - Hammer Pull Up - Standing upright, pull navel in and grab hammer hand grips. Palms face each other. - Chin Up - Standing upright, pull navel in and grab bar on inside of doorway, shoulder-width apart. Palms face you. - Regular Pushup - Place hands slightly wider than shoulder - width apart in on crossbar. neck hips and legs in a straight line. WIDELY USED - Easy to take it with you even traveling. Ideal for pull-ups, chin-ups, push-ups, dips, crunches and so on. Suitable for wight loss, upper body & core muscles activity. PROTECT YOUR DOORFRAMES - Easy To Install:Our doorframe guards are engineered to protect your doorframe by using a flat design. The chin-up bar is easy to install and does not require any drilling in your doorframe. 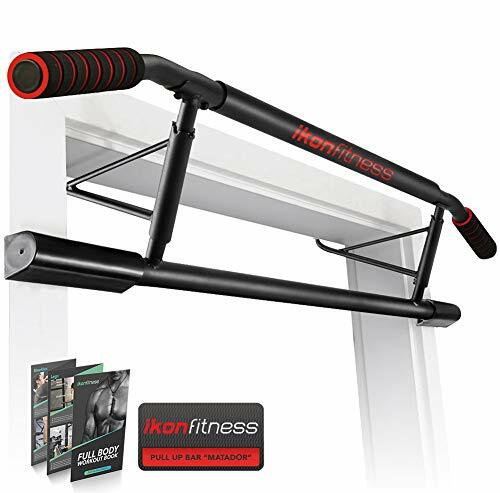 Iron Core Athletics Joist Mount Pull Up Bars are the ideal solution for those serious about their workouts. 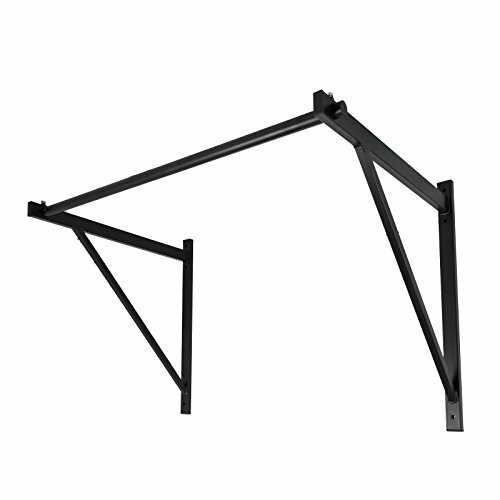 This is truly a heavy duty Pull Up Bar constructed of the highest quality materials and built to last. If you have outgrown your door mount pull up bar and are ready to move to the big time, this is likely the Pull Up Bar for you. 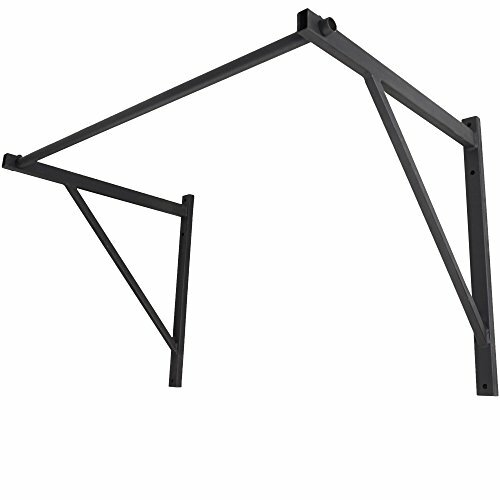 This joist mounted pull up bar can be installed anywhere there is an exposed beam or joist. 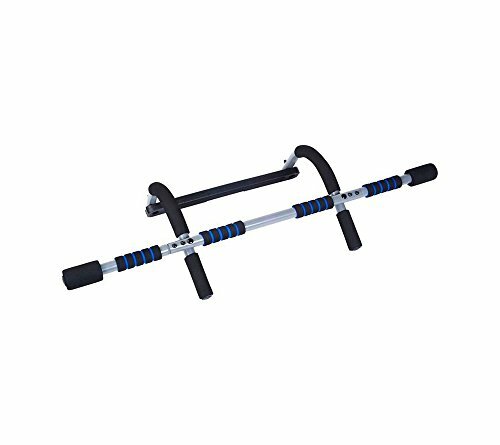 You can use this pull up bar for wide grip pull ups, chin-ups, neutral grip pull ups, hanging knees raises, it can also serve as an excellent anchor point for Suspension trainers or Gymnastics rings. Installing a pull up bar in your home is one of the best fitness investments you can make. Body weight training is taking the world by storm, join us at Iron Core Athletics in the pursuit of building true core strength in just minutes a day. -- High quality Joist Mount Pull Up Bar with Three sets of dense foam handles for multiple grip positions and maximum comfort. Iron Core Athletics is a leader in providing equipment targeted at building Core strength with high quality products at a fair price. We offer an industry leading 60 Day No Questions Asked return policy and warranty all of our products against defects for an entire year. Mounting Hardware for Wood Beams included. Note this is an industrial strength product similar to the ones used in gyms and Crossfit boxes.